In a nutshell: CO 3-4 times the amount of final sts you want. Once you reach the desired length of the frills, gather at the top (either k3tog if you multiplied by 3, or k2tog for 2 rows if you multiplied by 4). Advantage: This is the easiest method of making frills. They are dense and effective. Disadvantage: You have to CO so many sts which could be daunting. Gathered frills. Although it involves lots of stitches to start off with, the frills are dense, cute and easy to do. In a nutshell: 2 sts are either inc or dec for every repeat on alternate rows. 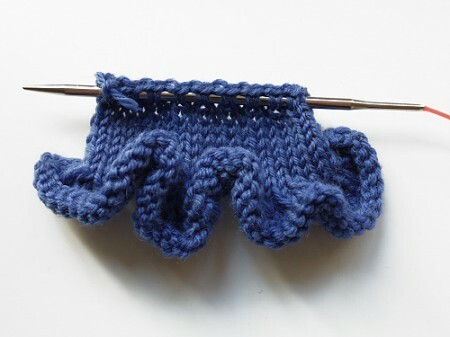 It gives a very prominent frills due to the use of ribbing. 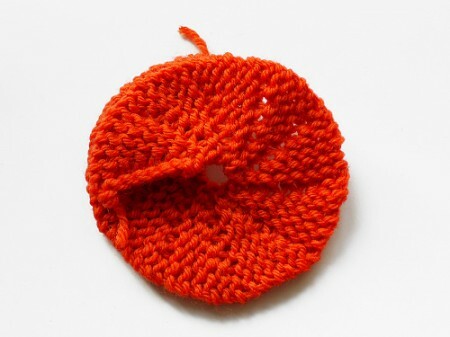 Bell frills can be knitted either up or down-wards according to your need. Advantage: Does not involve as many stitch number as the gathered frill technique. It also gives an ordered and prominent frill effect. 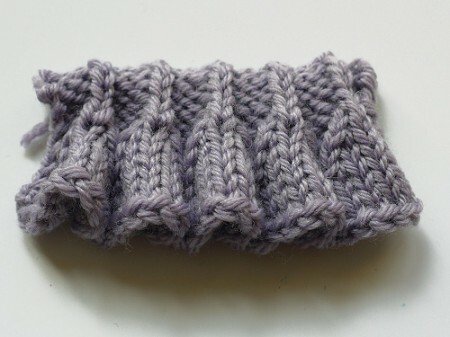 The identical effect can be achieved by both up or down direction of knitting (see further). Disadvantage: The frills are not as dense and random as the gathered frills. Multiple of 12 sts plus 3. Row 1 (RS): p3, *k9, p3. Repeat from * until end. Row2 (WS): k3, *p9, k3. Repeat from * until end. Row 3: p3, *ssk, k5, k2tog, p3. Repeat from * until end. Row 4: k3, *p7 k3. Repeat from * until end. Row 5: p3, *ssk, k3, k2tog, p3. Repeat from * until end. Row 6: k3, *p5, k3. Repeat from * until end. Row 7: p3, *ssk, k1, k2tog, p3. Repeat from * until end. Row 8: k3, *p3, k3. Repeat from * until end. Row 9: p3, *sl2tog, k1, psso, p3. Repeat from * until end..
Row 10: k3, *p1, k3. Repeat from * until end. Row 11: p3, *k1, p3. Repeat from * until end. Row 12: As row 10. Bell edging knitted from bottom up. Row 1 (RS): *p3, k1. Repeat from * until the last 3 sts, p3. Row2 (WS): *k3, p1. Repeat from * until the last 3 sts, k3. Row 3 and 4: Repeat rows 1 and 2 once more. Row 5: *p3, (k1, p1tbl, k1) into the next st. Repeat from * until the last 3 sts, p3. Row 6: *k3, p3. Repeat from * until the last 3 sts, k3. Row 7: *p3, yf, k3, yb. Repeat from * until the last 3 sts, p3. Row 8: *k3, p5. Repeat from * until the last 3 sts, k3. When you work the yo (i.e. yb and yf) made in the previous row, make sure to twist these sts to prevent holes being made. The same applies to the subsequent rows. Row 9: *p3, yf, k5, yb. Repeat from * the last 3 sts, p3. Row 10: *k3, p7. Repeat from * until end. Row 11: *p3, yf, k7, yb. Repeat from * until the last 3 sts, p3. Row 12: *k3, p9. Repeat from * until the last 3 sts, k3. Bell edging worked top down. Identical effect to the bell eding worked bottom up. Very useful indeed. In a nutshell: This is basically a series of horizontal darts to make a spiral with garter stitch. Stitches are later picked from the shorter edge and knitted at right angle. This technique can also be used to add frills on right or left side of the piece with larger number of stitches. Advantage: The length of frills depends on the number of sts casted on. So you can easily control how long / short your frills to be. It also gives a very prominent, ordered and dense frills. Disadvantage: It is a very time-consuming process as garter stitches does not grow fast… I only recommend this technique when you are working on a smaller projects. Row 1: k8, wrap and turn. Row 2: k8. Row 3: k7, wrap and turn. Row 4: k7. Row 5: k6, wrap and turn. Row 6: k6. Row 7: k5, wrap and turn. Row 8: k5. Row 9: k4, wrap and turn. Row 10: k4. Row 11: k3, wrap and turn. Row 12: k3. Row 13: k2, wrap and turn. Row 14: k2. Row 15 and 16: k10. Note: here, you have an option of picking up the wrap (see the video tutorial). With garter stitch, you don’t usually need to pick up the wrap but depending on the yarn, you may have holes where you have wrapped and turned. 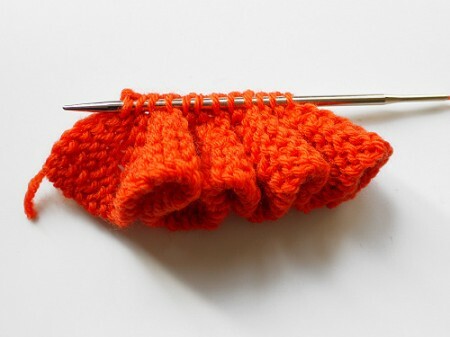 Repeat these 16 rows until you have the desired length along the shorter edge. 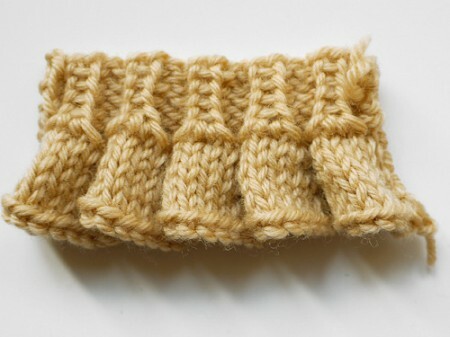 Then pick up the desired number of stitches to knit vertically (below). Short row frills after picking up the stitches along the shorter edge to knit vertically.